For the most even skin tone and smoothest complexion, Dew Dab is the go-to Dab. It tones skin issues that somehow appear overnight. Dab, dress, and caress your skin after cleansing with the Best Skin Ever every morning and evening for glowing results. Directions: Simply tilt the bottle to release one drop onto your fingertip and apply directly to the spot. A little dab will do! Dab directly, undiluted or as beautiful additive to Living Libation's Sandalwood Serum Supreme, Sandalwood Best Skin Ever, Soothsayer Serum, Rose Renewal, or All Seeing Eye Creme. Ingredients: Eriocephalus punctualus (Cape Chamomile), Rosa damascena (Rose Otto), Cupressus semperviren (Cypress), Boswellia carterii (Frankincense), Helichrysum italicum (Immortelle), and Lavandula angustifolia (Lavender). Cystic acne killer! I either dab a little on where there is a current pimple or one that i feel is about to form and the next morning its either much smaller or dimished. Helps with the pain as well. Some days I add a few drops to my Best Skin Ever oil when i feel a breakout coming on. The scent is a little strong but eventually wares off. Must purchase product for sure. This stuff is the bomb, my skin is super nice since I've been adding a few drops into my lotion. I love this stuff. Any cystic acne I get, I put this on 3 to 4 times a day and it's gone within a couple of days. I'd recommend this stuff to anyone. Amazing product for clearing up blemishes, blackheads, and hyper pigmentation. 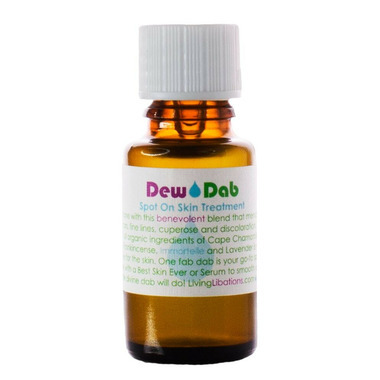 I use Dew Dab with Living Libations BSE Seabuckthorn Oil, and my oily and acne prone skin has transformed into clearer softer skin.